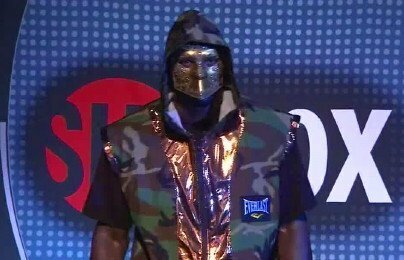 Deontay Wilder the 2008 Olympian and most recent US male boxing medalist headlined Showtime’s SHOBOX card from Indio, California and won in style. A sudden and brutal conclusion capped off a quiet first round as a hard right hand sent Siarhei Liakhovich down to the canvas. His body began to convulse, reminiscent of the Nonito Donaire and Fernando Montiel knockout and gave referee Tom Taylor no choice but to call a halt to the contest. Wilder is now undefeated through twenty nine professional contests with all of them by knockout while averaging under two rounds per bout. This would appear to be a phenomenal feat on paper but in reality it is not as exciting when observed more closely. What he has done so far is not an easy task but it is not helping him develop as a fighter. When this fight was made there was a general dissatisfaction with the choice of opponent for Wilder but there was a hope that Liakhovich could go a few rounds and test Wilder. Despite coming off of a seventeen month layoff and back to back stoppage losses the man dubbed the White Wolf had always gone into the later stages of the fights he had lost and made his opponents bring out their best. Since Wilder had not gone past the fifth round it would appear that maybe Liakhovich would provide the experience and composure he had gained from a fourteen year professional career which at its height saw him crowned the World Boxing Organization Heavyweight Champion. Just two fights ago Liakhovich did push European contender Robert Helenius in a good fight before being knocked out by the big Finnish fighter. The fight tonight did not result in the test boxing pundits and fans alike wanted to see and no questions have been answered about Wilder who has been accused of coming up too soft. If there is a positive to be taken from this early win it does further vindicate the destructive power of Wilder’s right hand which ended matters quickly. He knocked out a tough veteran fighter with only eight punches in a matter of minutes when it had taken other fighters several rounds and plenty of punishment. Sure Liakhovich is a shot fighter but this fight was over before that played a real part of the ending. Unfortunately Wilder is now closing in on thirty professional bouts and has not been taken into the second half of a fight let alone the scheduled distance. Without rounds in the bank he will not progress as a fighter. His stamina obviously will not be tested but more importantly early fights mean no adjustments. Except for his one bout with journeyman Harold Scorniers where he was on the canvas Wilder has not had to dig deep, form a plan B, or show us his defense. What is going to happen when these guys punch back? What is going to happen when these guys do not fall down? Well these vital questions will have to wait until next time. All in all the opposition is improving though at a molasses pace and I suspect another opponent of similar level for his next outing. Only future fights can further our judgments of Wilder as tonight’s fight did not achieve this. The second bout of the evening in a night of short fights was a crowd pleaser which had its share of moments. The bout between undefeated super featherweights Francisco Vargas and Brandon Bennett was the longest and most competitive fight of the night despite it being a very one sided decision. Vargas with sixteen wins and thirteen stoppages entering the contest was a 2008 Mexican Olympian who had not been past the fourth round until tonight. Bennett of Cincinnati is coached by Mike Stafford the trainer of Welterweight titlist Adrien Broner who rapped for his entrance to the ring. Bennett was very cool and loose during his ring walk and had a very good opening round. This success was not to be long term. Vargas who had an interesting entrance of his own wearing a mask and a cowboy hat appeared to study his opponent the entire round and lost the round mostly on a lack of activity. Vargas became more aggressive in the second round and exerted his physical nature to counter act the much faster Bennett. Round four appeared to be the point of no return as Vargas went on to dominate the remainder of the fight except for a brief moment in round five when Bennett was brought to life by a cut over the left eye of Vargas from a clash of heads. The high point of the fight was the very entertaining round four. Bennett after a solid first round saw the next two slip away and he came out throwing. Bennett went toe to toe with Vargas in the first minute as he tried to gain the upper hand inside. However, this was where Vargas flourished and as the round went on Vargas began to overtake Bennett and grab the momentum of the fight. Viscous body punching and mauling inside appeared to take the life out of Bennett who was stationary the rest of the fight. From this point on it appeared it might have been a matter of time before Vargas would eventually wear him down and stop him. After the sixth or seventh round the fight was in cruise control as Bennett was unable to reclaim any momentum and statistics showed that his output continued to decrease after round four on. Having not scored a single stoppage past the fourth round it was looking bleak for Bennett who was taking a bad beating to the body. The fight did make the distance and Bennett to his credit fought a spirited tenth round despite being behind badly and needing a knockout. Bennett never quit in the fight and that is important moving forward as he was overwhelmed but never lost confidence. His problems were more of a lack of tough opposition and having never really been tested. His punches resembled slaps and his strategy was very poor. Due to the fact that he could not hurt or get the respect of Vargas, Vargas could continually walk him down and it was either by choice or due to the damage caused by the body shots that Bennett fought very stationary and played into the hands of Vargas. Bennett did show an understanding of distance and movement but did not put it into play. More experience should remedy these problems as he proved he was very tough and fairly athletic. If he could improve his punching and learn to use his physical gifts more he may be able to turn the career back on track. Vargas to his credits earned nothing but praise tonight as he improved to seventeen wins without a loss and passed the fourth round for the first time. For a fighter with less than twenty fights his body punching was relentless and superb. His punch variation was also impressive which shows he has an understanding of the game beyond his amount of fights. Another great aspect of tonight was going six rounds further than he had ever gone without much difficulty and fought hard with a nasty cut. He never seemed bothered and never complained or picked at it. He stayed confident and determined the whole fight and did not lose focus. Did not see much to criticize him for, might be predictable coming forward but it has worked so far. In the opener undefeated junior middleweight Jermall Charlo only twenty three from Houston, Texas made easy work of the veteran Antwone Smith. Much like the main event it appeared on paper that the experienced Smith who had only been stopped once and has had a long career would be a big test for the rising Charlo. What unfolded was the exact opposite as Smith came in at a career heaviest of 159 pounds a full five pounds over the contracted limit. Despite the size advantage Smith showed no life in the short fight which did not make it past the second round. Smith who had been a tough night for some recognizable names just stood stationary and attempted to use a shoulder roll defense to set up a right hand. The young Charlo generated great leverage onto his punches and impressed me with his combination punching and punch variation. His jab and left hook were very effective but the fight was ultimately ended on a solid looping right hand. Smith did get to his feet but wobble forwards with his hands raised above his head. Referee Thomas Taylor was given no choice but to stop the fight and this one did not answer any questions. Charlo, dubbed the hammer, showed the power we knew he had as he improved to fifteen wins without a loss and eleven inside the distance but he was given no resistance. Smith earns his fifth loss in twenty nine fights and his second by stoppage.